Home Costs > How Much Does Knob and Tube Wiring Replacement Cost? How Much Does Knob and Tube Wiring Replacement Cost? Knob and tube wiring, commonly known as K&T or open wiring, is an older form of electrical distribution consisting of two longer wires wrapped in a rubber insulator, ran along the beams of the home and wrapped around a ceramic-based tube at the joints to prevent chafing. 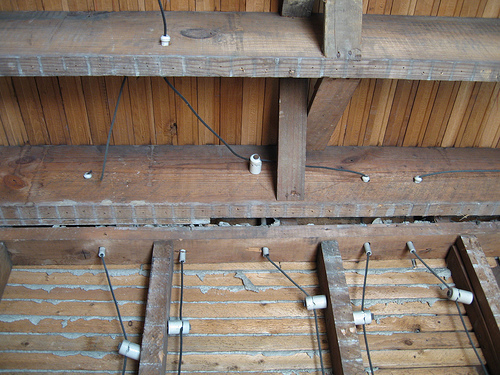 This type of wiring started in the last 1800s and was used in homes up until the 1930s. If your home was built in the late 1800s to the early 1900s, there’s a pretty good chance your home will have this sort of setup. If your home still uses the knob and tube electrical system, you may find it difficult to find an insurance company that is willing to insure your home. The reason for this is that these older systems could have worn out wires that have shorts in it, causing electrical problems such as shorting out, starting fires and/or even causing small explosions. The cost to replace knob and tube wiring will vary depending on the size of the house, the number of floors, how much wiring needs to be replaced, the geographical area and electrician doing the job. The average cost for replacement, according to our research, can be around $500 to $1,500 or more per room. This question was asked by a member on Zillow, and a few members said you should expect to pay about $5,000 for a 1,200 square foot home to replace the entire wiring system, bringing the replacement average to about $4 per square foot if you’re looking to have an entire home’s system replaced. Angie’s List says if you want to replace the knob and tube wiring inside your home, then you should be prepared to spend $8,000 to $15,000 for a 1,500 to 3,000 square foot home. The article also mentions that you should be prepared to upgrade the service to your home to 100 amps at a minimum, but most contractors will recommend 200. On this Reddit thread, one member said they had purchased a three-story home with a basement, and when everything was said and done, the total costs, when outsourced out, was close to $10,000. This quote, according to the post, included a new second breaker on the second floor and was in the Chicago area, which is known to be pricier than other cities in the United States. A member on this City-data.com thread said they had paid $4,000 for a 3,200 square foot home. The price estimate we mentioned above should include the labor and parts needed to complete the job. A reputable electrician will always offer you a contract up front, clearly stating what’s going to be included in their estimate. These estimates will include running the new wires, filling any holes made, disconnecting the old system, installing a new junction box, replacing fuses and updating any outlets or electrical components that need to be updated. According to SpearesElectric.com, there are two ways to replace knob and tube wiring. The first method involves running the wires in the fastest and shortest route by destroying the walls and ceiling of the house. This is known to save you money on electrical costs since you look for the fastest possible route. The second method involves looking for ways to fish the wiring through the walls and ceilings. Regardless of how the wiring is removed and/or replaced, plan on having your electricity shut off for a few hours as the electrician works on your home. Depending on which part of the house has the wiring replaced, you may need to put up insulation in preparation for any work you want to do with your walls or ceiling. If the electrician has to be open up the ceiling and/or walls and doesn’t include the patching in their quote, then you need to budget for patching and painting the drywall. The costs can increase if you have more than one floor and/or your home doesn’t have a crawl space or attic access. The panel, more often than not, will need to be replaced as well, and this may or may not be included in the initial quote. Depending on the complexity of the electrical job, you may need to tear down walls and ceilings just to get to higher floors of the house and install a more modern electrical system. If your house has knob and tube wiring and a distribution panel that has never been updated, the house may also have other problems associated with older homes. These problems include untreated asbestos insulation and burst and/or frozen lead water pipes. There might be other things that require immediate attention other than the electrical wires. If you are replacing knob and tube wiring with aluminum wiring, you must keep in mind that aluminum wiring can cause problems when it is installed with the wrong light switches and/or electrical outlets. Weigh your options regarding the type of replacement you want. While the initial replacement that involves tearing down walls may be cheaper at first, the charge of replacing damaged walls can cause the project to become even more expensive. Ask the electrician how much damage he or she thinks the walls will incur and then decide which would be best for your situation. Knob and tube wiring, according to Mr. Electric, is dangerous because it uses a sheathing that can wear away over time, its two-stranded, meaning there’s no ground wire, it doesn’t carry high ampacity loads, and it also uses a two-prong receptacle, restricting the use of smaller appliances. If you are planning to replace the knob and tube wiring system in your house, consider getting three to five quotes. Most contractors will be more than happy to offer a free estimate. If you don’t know where to find these estimates, HomeAdvisor.com can match you up with countless licensed and respected contractors in your area for free. Simply describe your job and watch the quotes roll in. A two story home approx. 2100sf. Cost included high-end Lutron devices and hard-wired smoke detectors. Price excluded light fixtures and repairing of holes made in plaster.